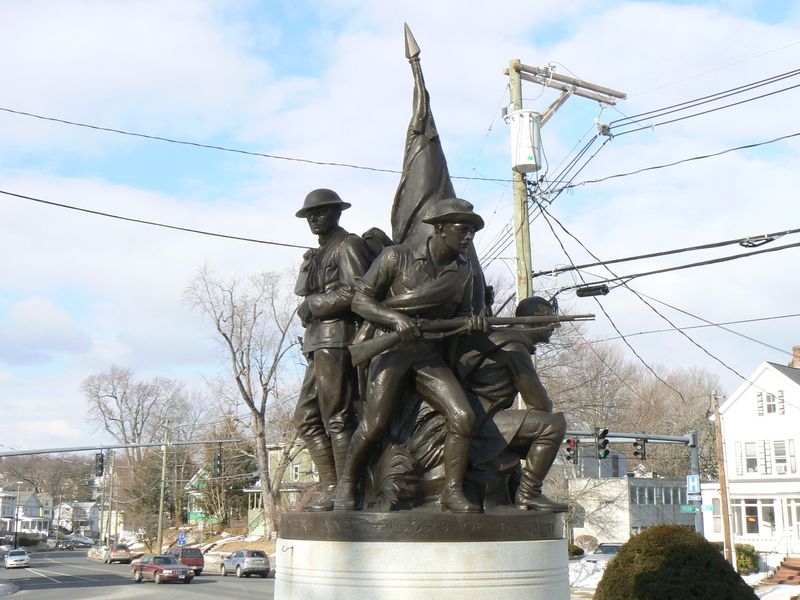 The Veterans’ Memorial in Farmington provides an unusually comprehensive tribute to local residents who participated in wars and skirmishes. 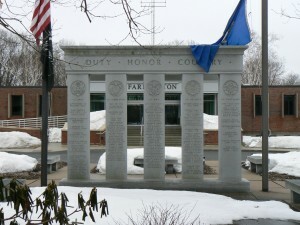 The 1992 monument, in front of Town Hall and near the intersection of Farmington Avenue (Route 4) and Monteith Drive, features five granite columns inscribed with the names of residents who died while serving the nation. 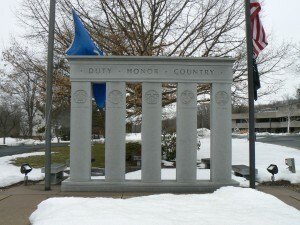 The monument’s front (northwest) face bears the simple inscription “Duty, Honor, Country” and five service branch emblems. 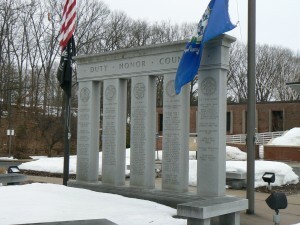 The monument’s columns also list military conflicts starting with early battles including the English settlers’ fights with the Pequots in the 1630s, the French and Indian Wars and the 1712 Defense of Litchfield. 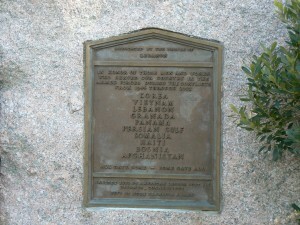 More recent conflicts listed on the monuments include peacekeeping in Lebanon (1982-4), the Grenada invasion in 1983 and Operation Desert Storm in 1990-91). Looking at major conflicts more typically cited on municipal war memorials, the Farmington monument lists the names of 11 residents killed or wounded in the American Revolution; 63 in the Civil War; eight in World War I; 18 in World War II; and five in Vietnam. The monument’s southeast face repeats the service emblems, but is otherwise unlettered. 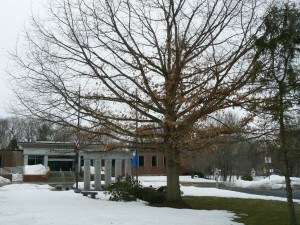 A tree in front of the Veterans’ Memorial is a descendent of Hartford’s Charter Oak. 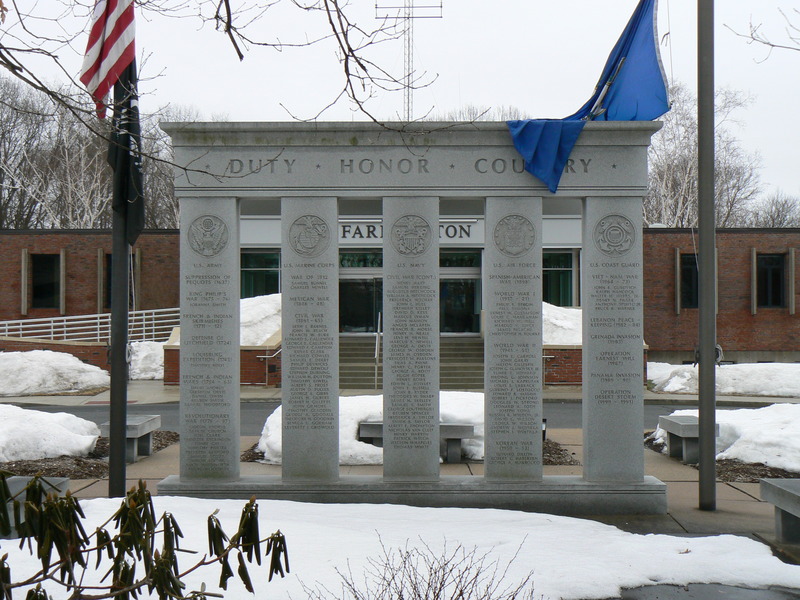 Farmington’s Civil War, World War I, World War II and Vietnam heroes are also honored with monuments in the town’s Riverside Cemetery. Danbury honors veterans of several wars with a 1931 Memorial on the West Street green. 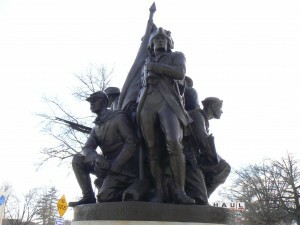 The Soldiers and Sailors Memorial, near the intersection of West and Division streets, is dedicated to soldiers and sailors who served in the American Revolution, the Civil War, the Spanish-American War, and World War I. The monument features a bronze group of four soldiers and a sailor standing atop a round granite pillar. 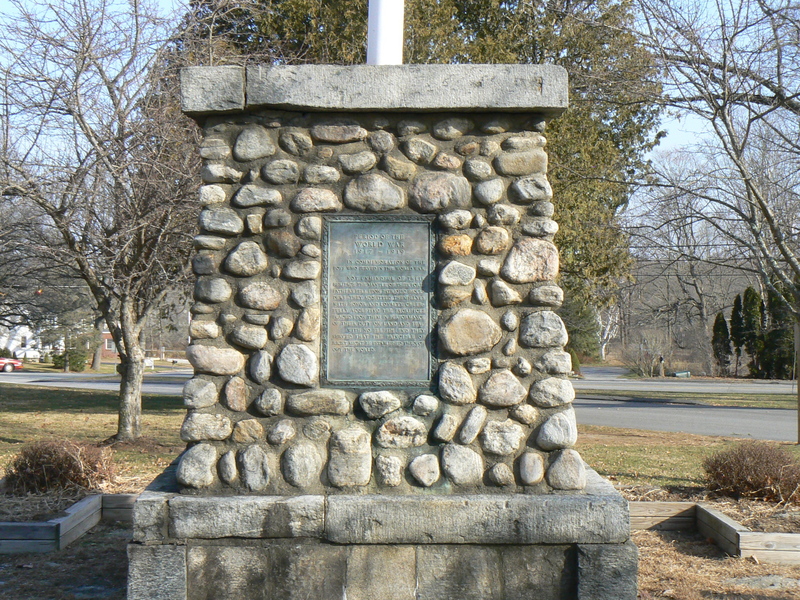 A dedication at the monument’s base reads, “Dedicated to the soldiers and sailors of Danbury,” along with years in which the various conflicts started (1776, 1861, 1898, and 1917). 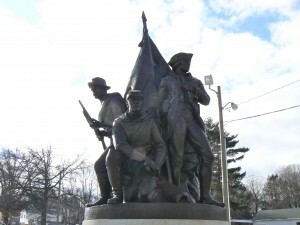 The American Revolution and World War I figures are standing, the Civil War figure and sailor are in kneeling positions, and the Spanish-American war figure is crouched with a rifle at the ready. All of the figures have a variety of personal equipment. 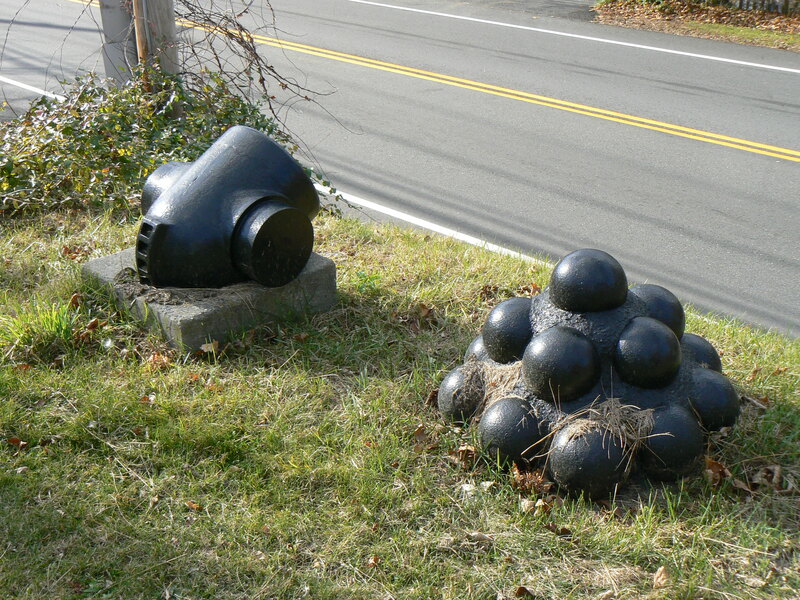 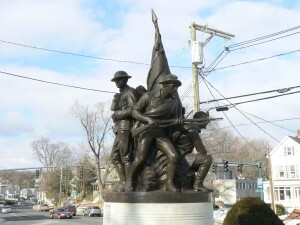 The figures were created by sculptor Donald E. Curran, a Darien resident who won a design competition. To the east of the Memorial, a granite boulder bears a plaque, dedicated in 1952, that honors Danbury’s World War II veterans. 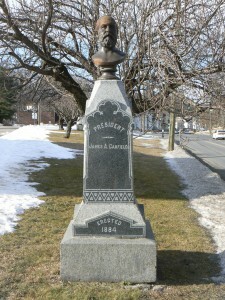 At the eastern end of the green, a memorial honors president James A. Garfield, a Civil War veteran. 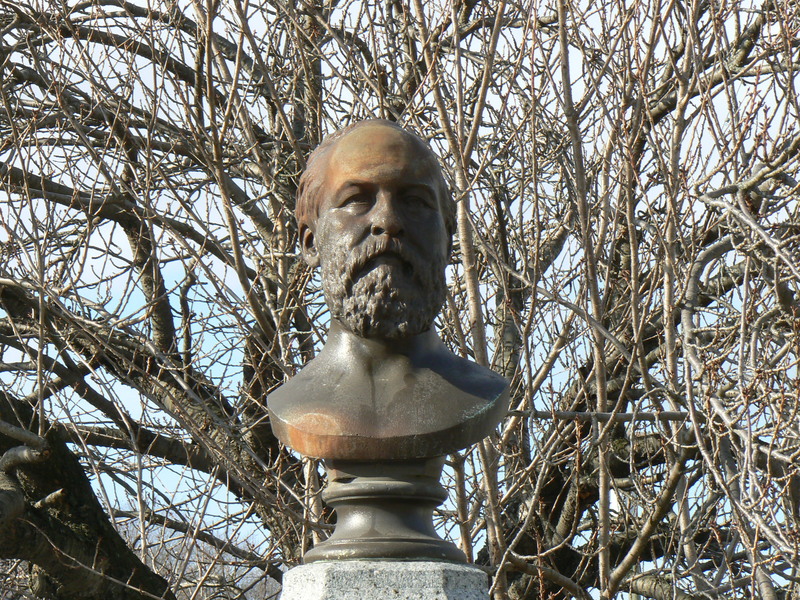 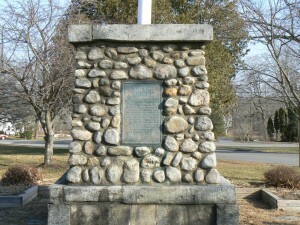 The monument was erected in a park on West Wooster Street in 1884 by local philanthropist Edward A. Houseman, and moved to the West Street Green in 1931. 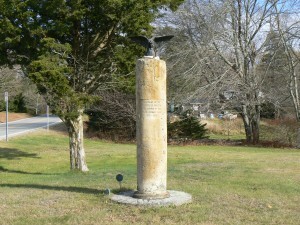 The monument was restored in 1993 after it was struck by a car. 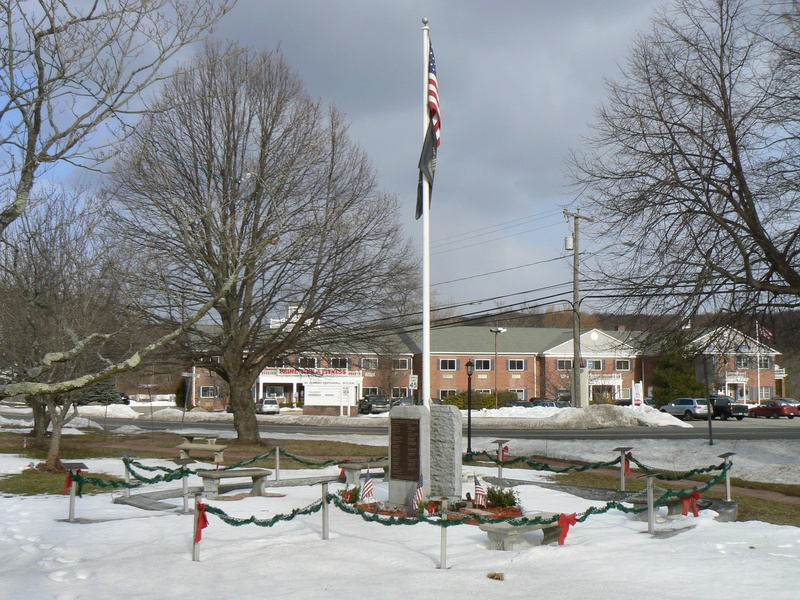 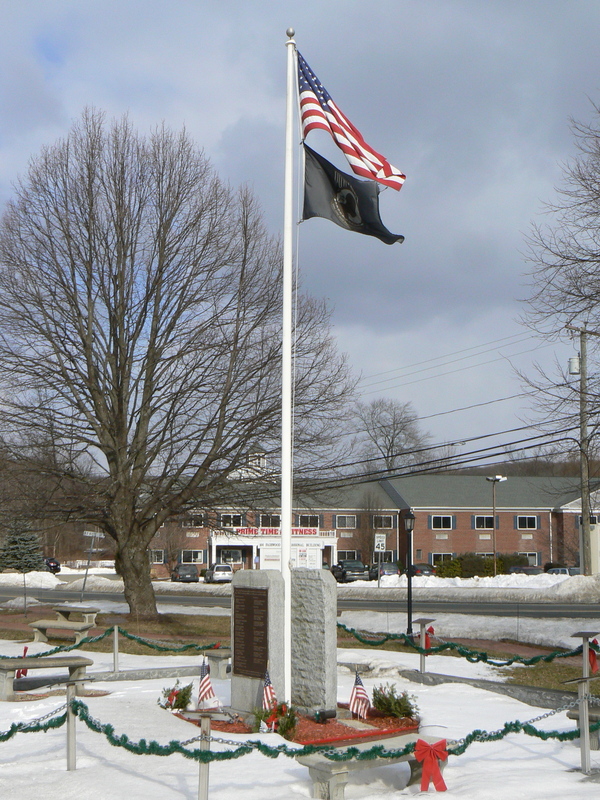 New Fairfield honors veterans of all wars with a monument on the town green. 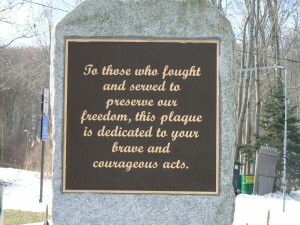 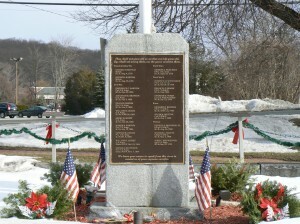 The New Fairfield Veterans’ Memorial, located on Pembroke Road (Route 37) just north of the intersection with Brush Hill Road (Route 39), was dedicated on September 20, 1997. 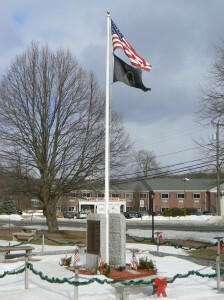 The monument features two granite tablets, a flagpole and a dozen markers listing the country’s major wars. 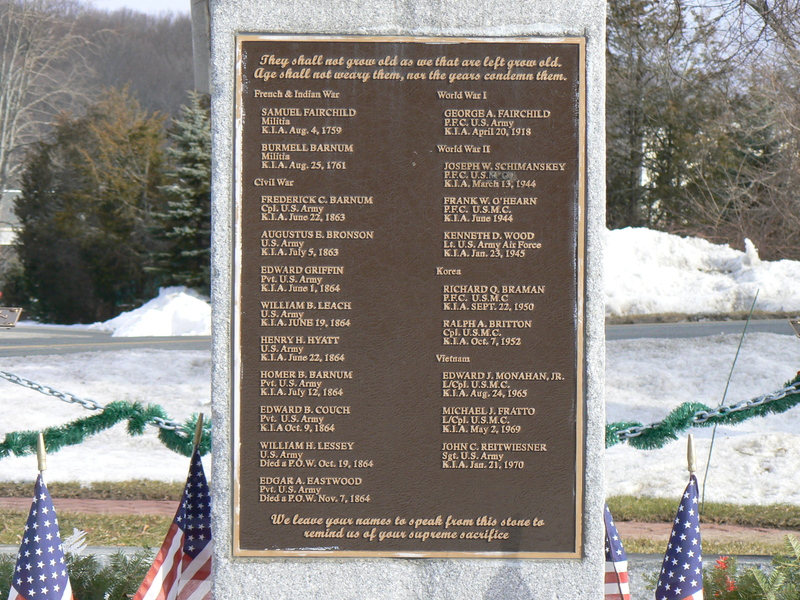 The west tablet honors New Fairfield residents who died fighting in wars starting with two militia members killed during the French and Indian War. 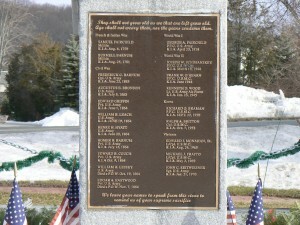 Nine residents are listed for the Civil War; one for World War I; three for World War II; two for Korea; and three for Vietnam. 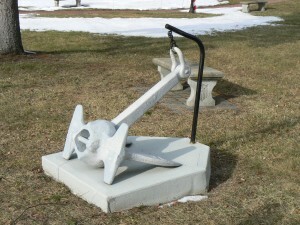 The green also features a ship’s anchor and a number of benches inscribed with the United States seal. 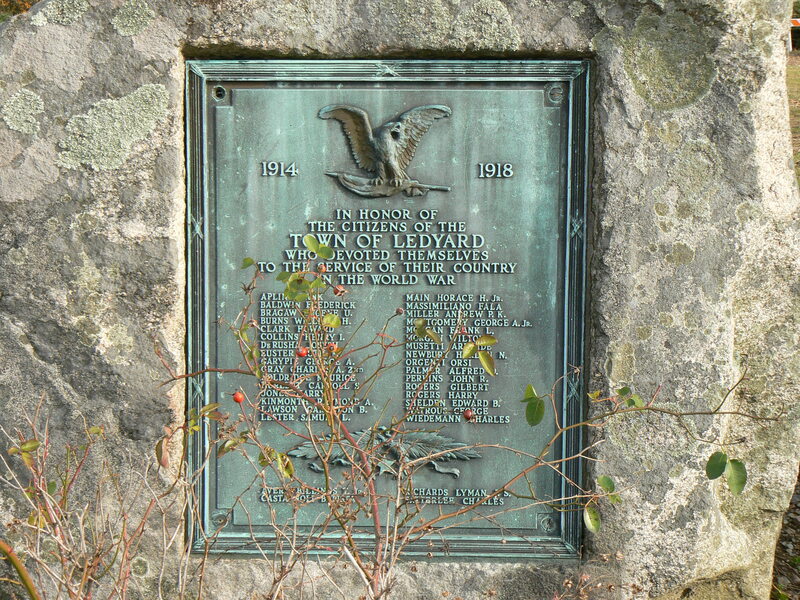 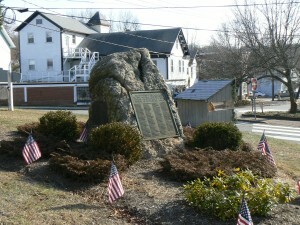 East Hampton honors veterans of World War I and earlier conflicts with plaques on a boulder in its historic village center. 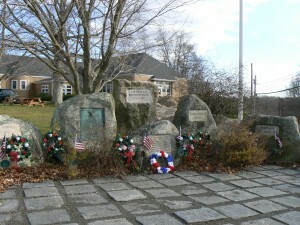 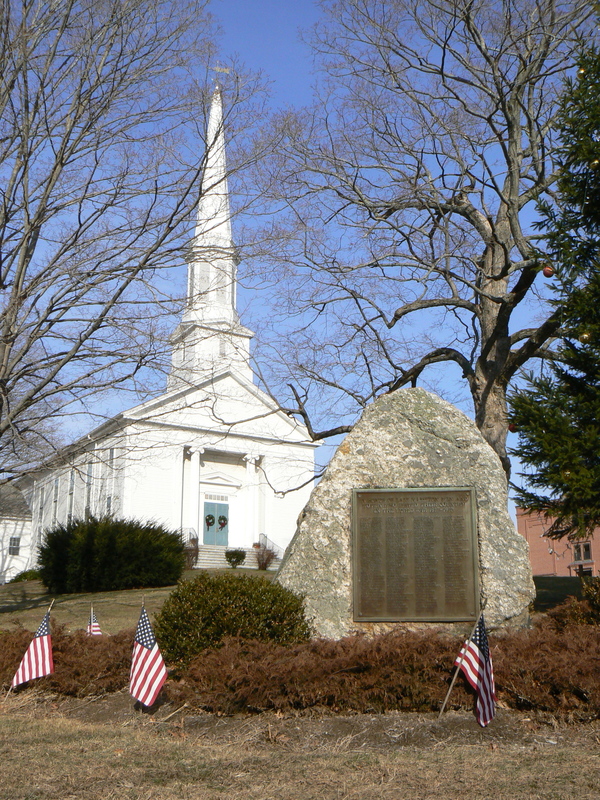 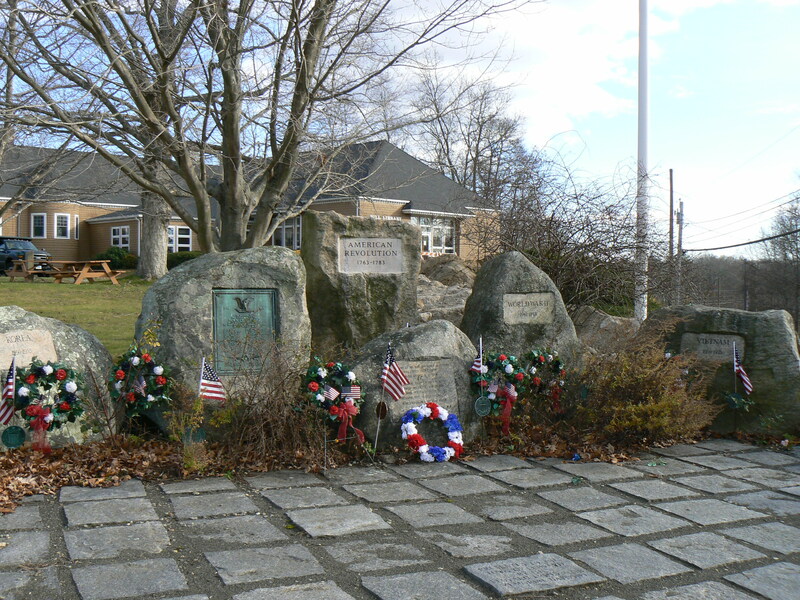 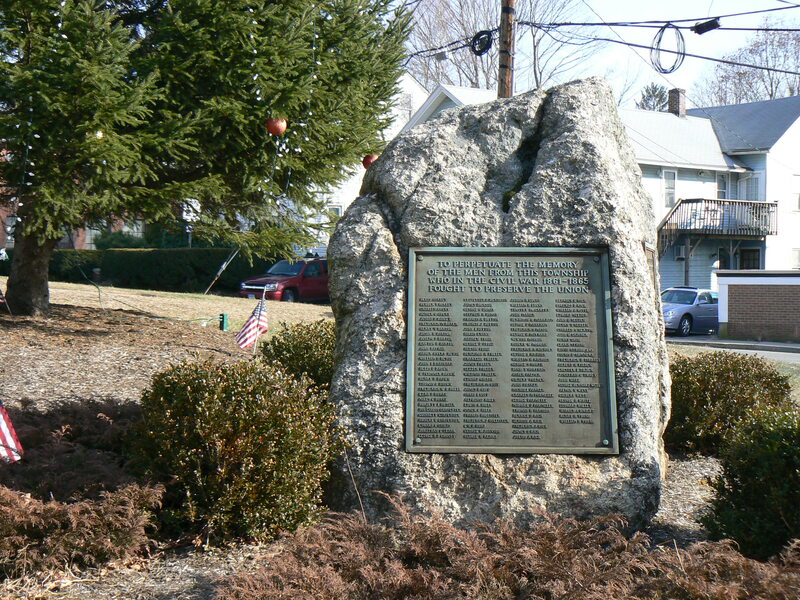 The undated war memorial, at the intersection of Main Street and Summit Street (Route 196), honors veterans of World War I, the Spanish-American War, the Civil War, the War of 1812 and the American Revolution with plaques mounted on a large boulder. 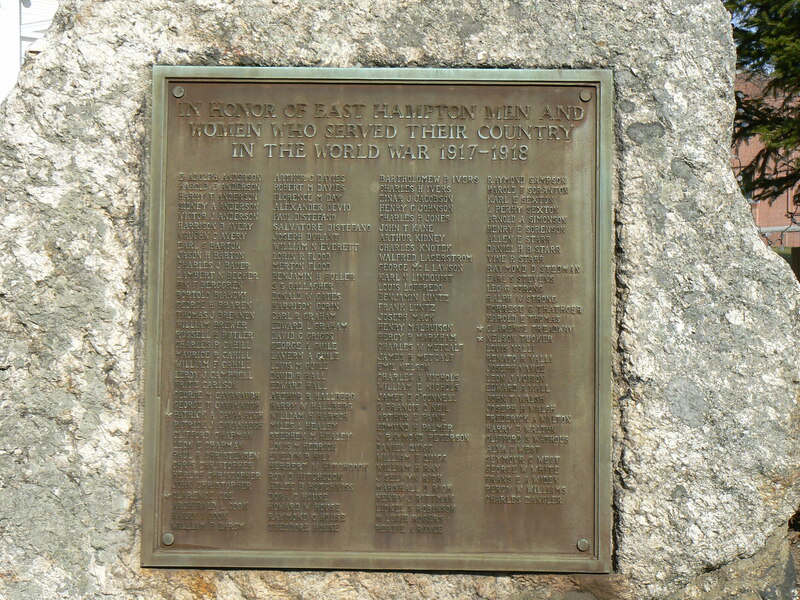 Below the dedication, the plaque lists about 141 names, and indicates four who were killed in the war. 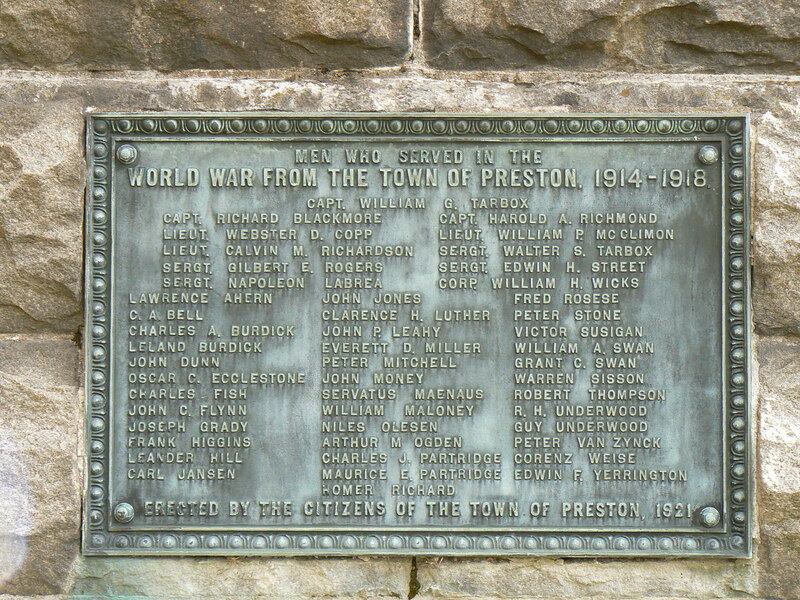 The plaque further lists about 109 residents who served in the war. 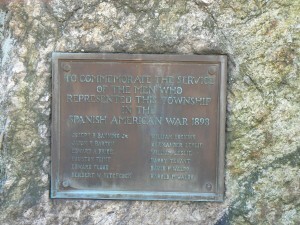 The monument’s north face honors a dozen residents who served in the Spanish-American War. 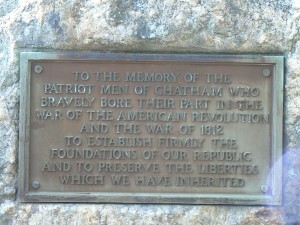 The reference to Chatham reflects East Hampton’s former name. 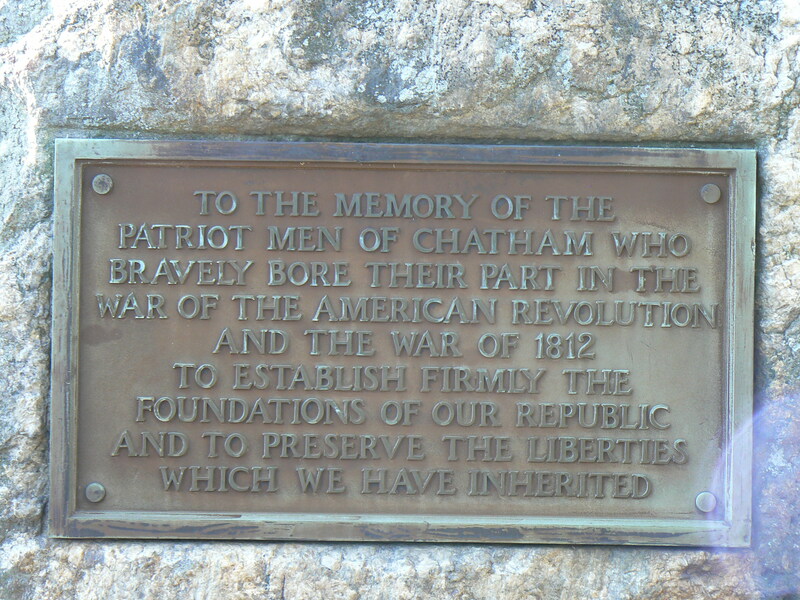 The town separated from Middletown in 1767, and was known as Chatham from then until it adopted the East Hampton name in 1915. 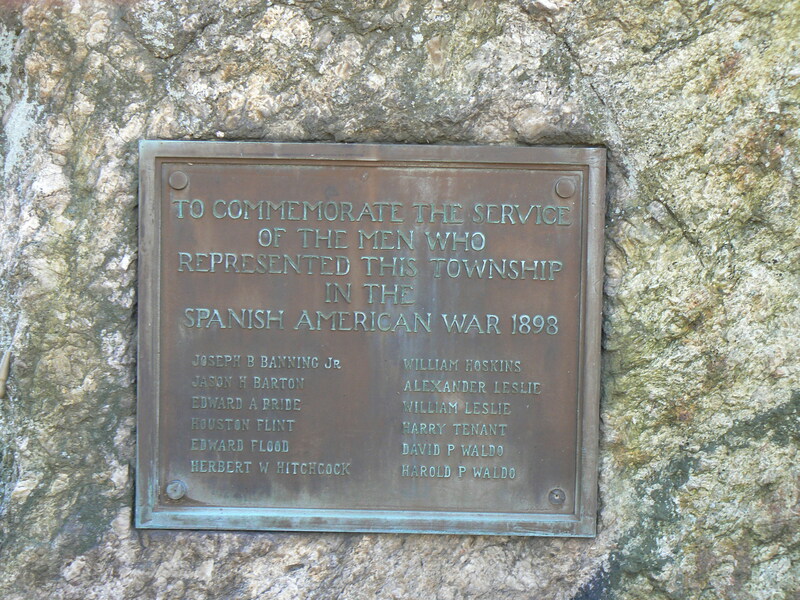 The fact that the Civil War and Spanish-American War plaques refer to “this township” probably reflects the name change in the intervening years. 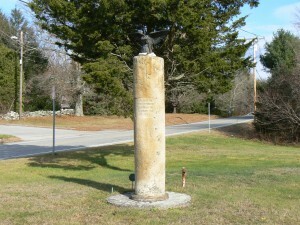 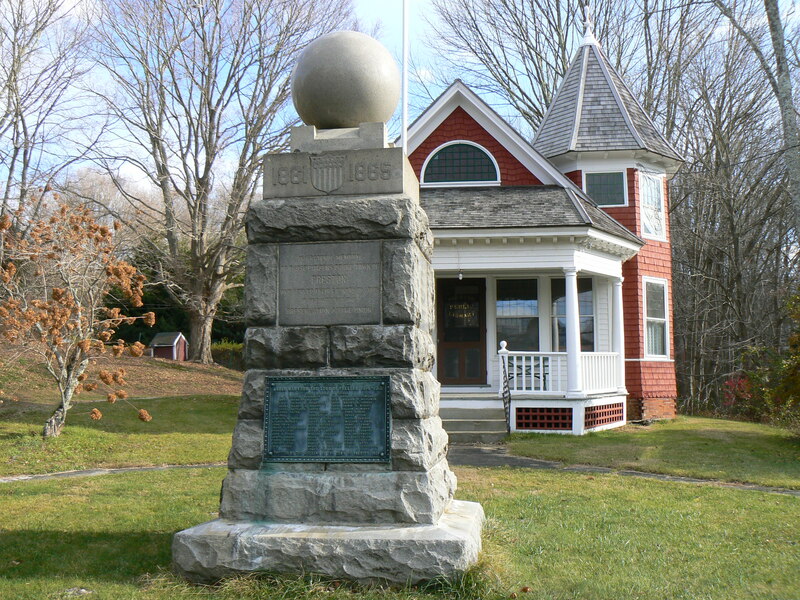 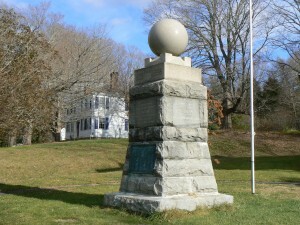 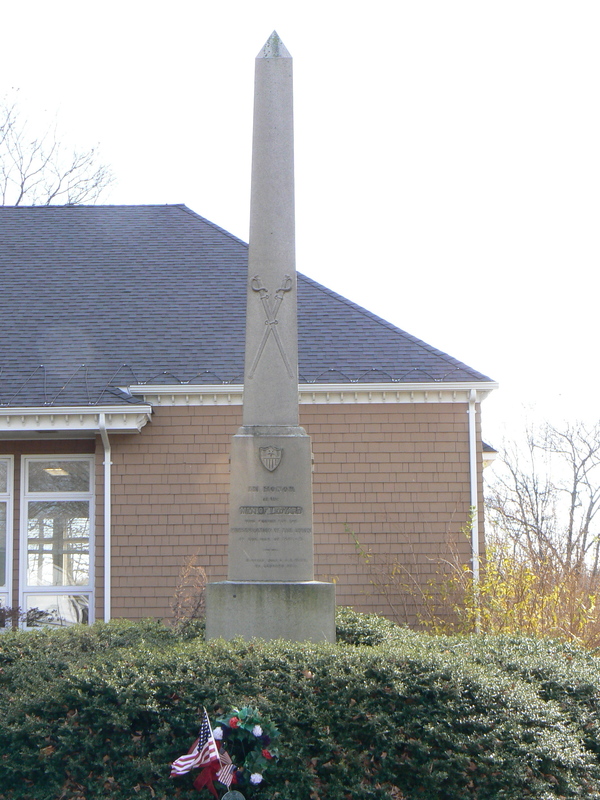 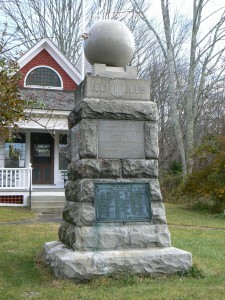 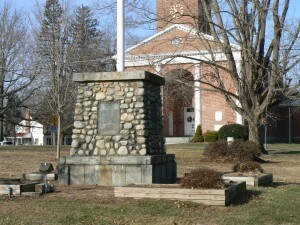 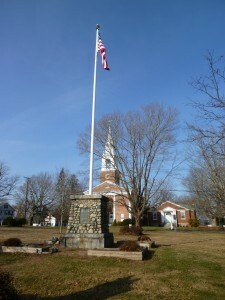 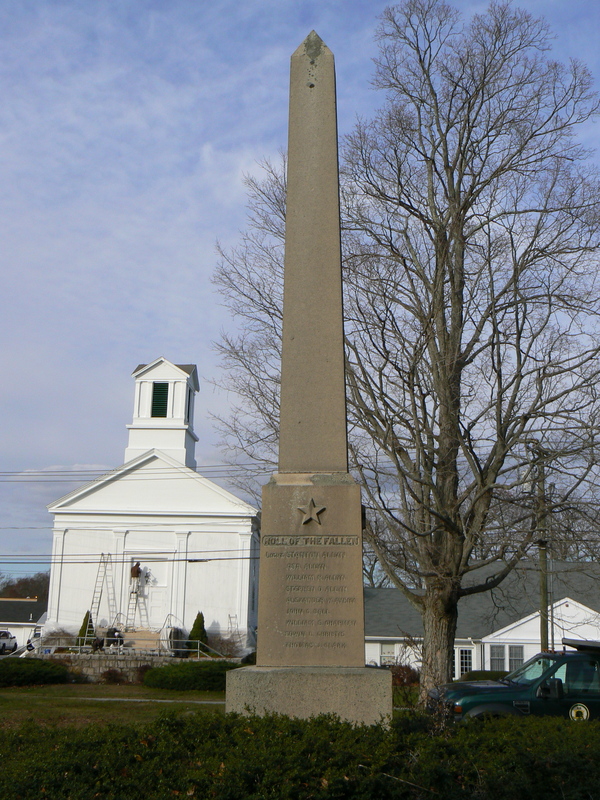 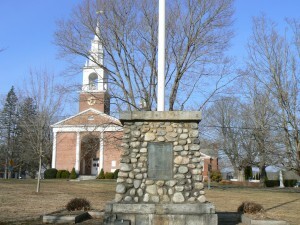 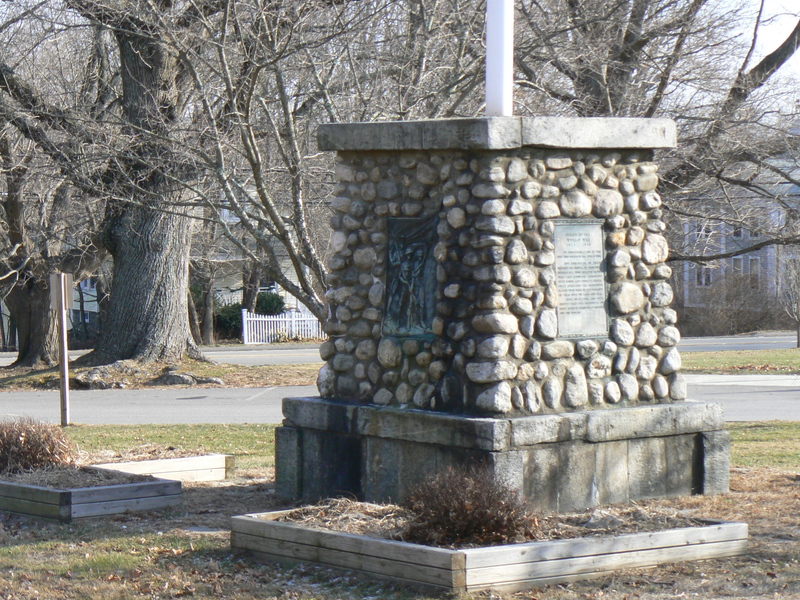 The monument stands in East Hampton’s Belltown Historic District, which is listed on the National Register of Historic Places. 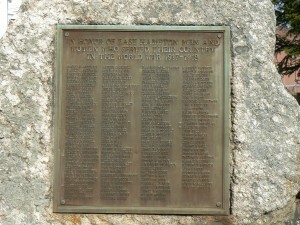 East Hampton was a leading center for the manufacture of bells during the 19th Century and the early 20th. 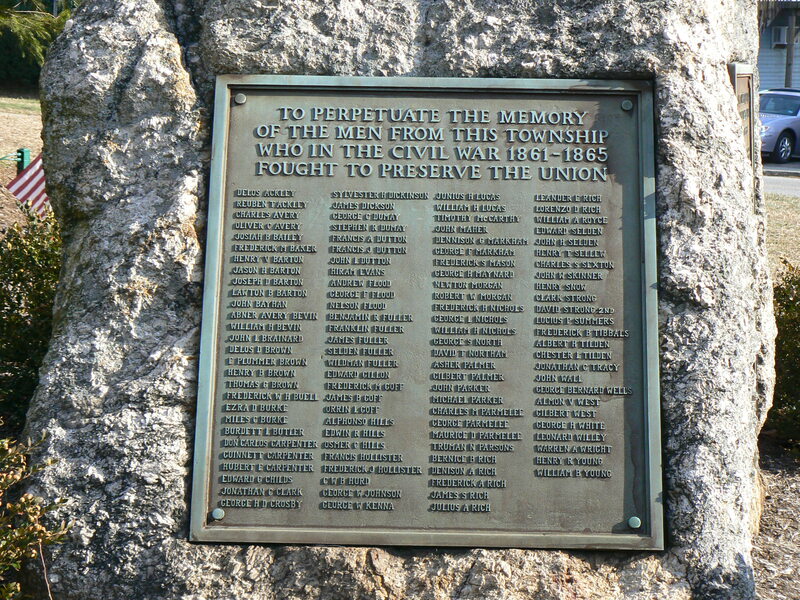 According to the 1860 census, nearly half of East Hampton’s 1,766 residents, many of whom were Irish immigrants, worked for one of the town’s 30 bell factories. 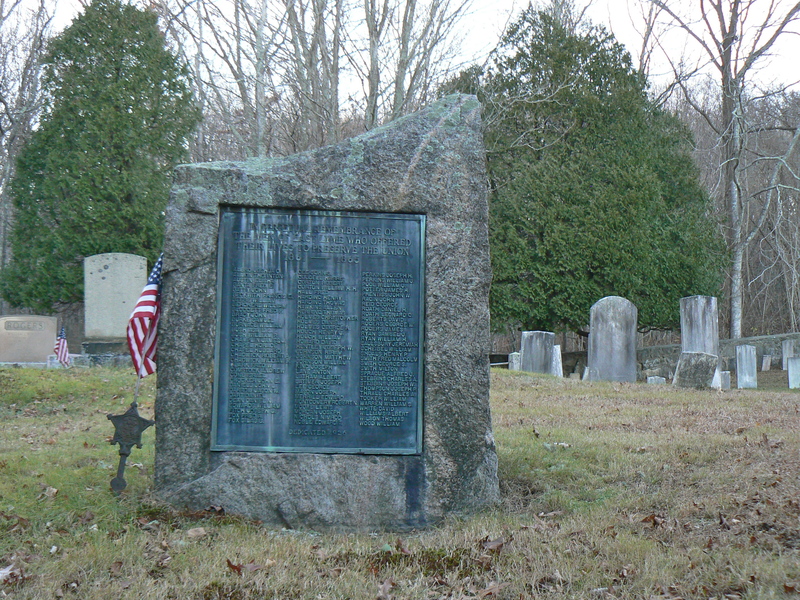 East Lyme’s Civil War veterans are honored with a 1926 monument in the historic Old Stone Church Burial Ground. 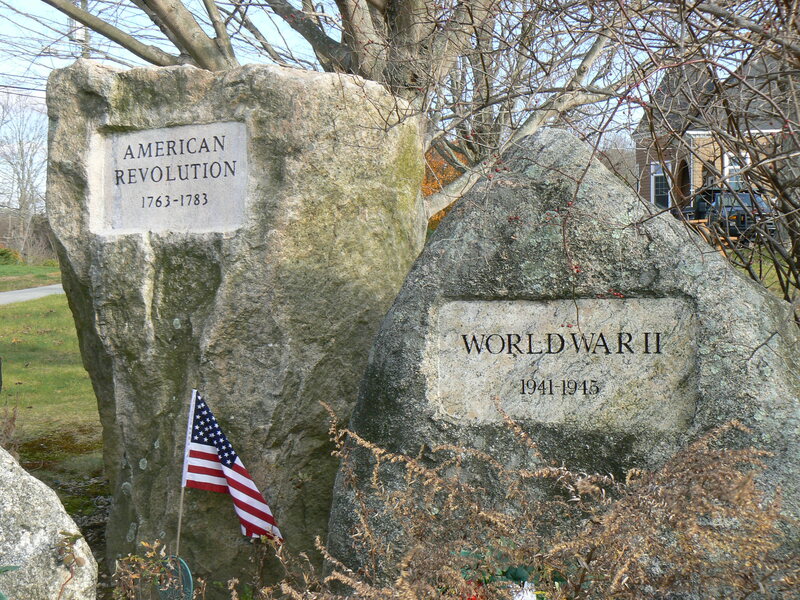 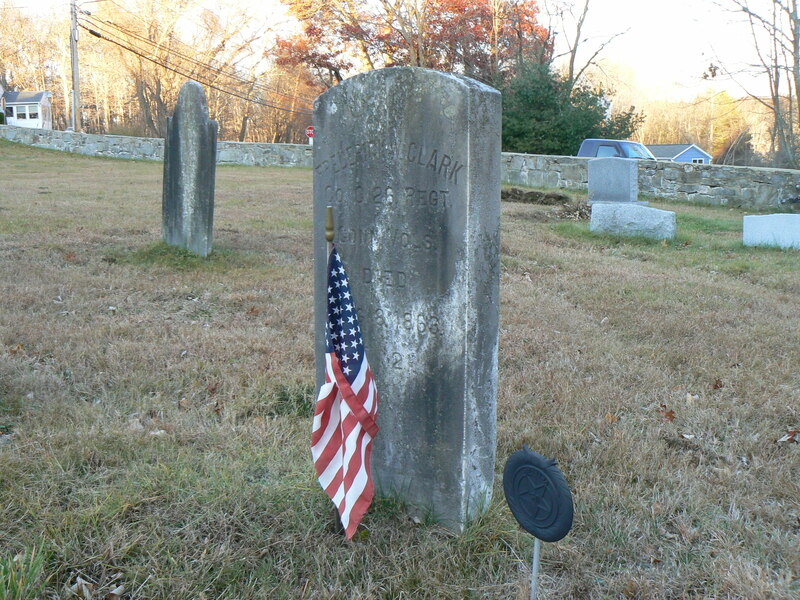 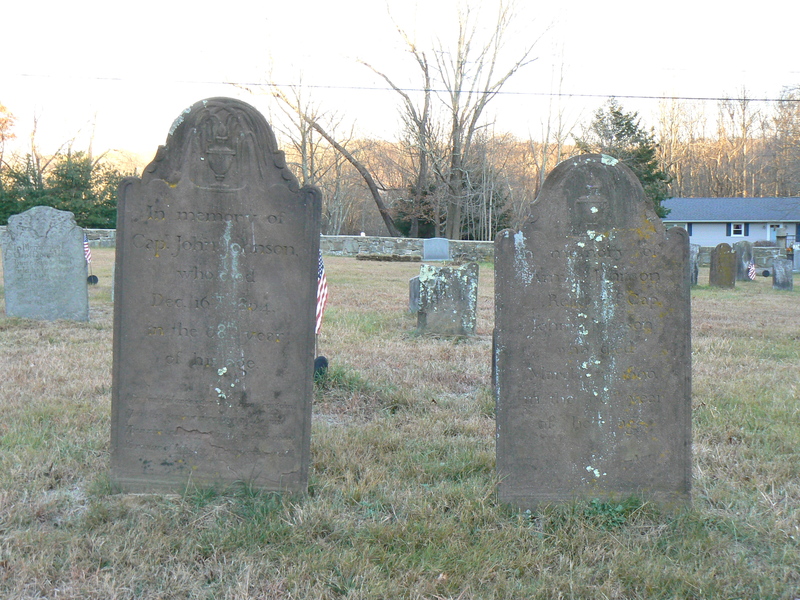 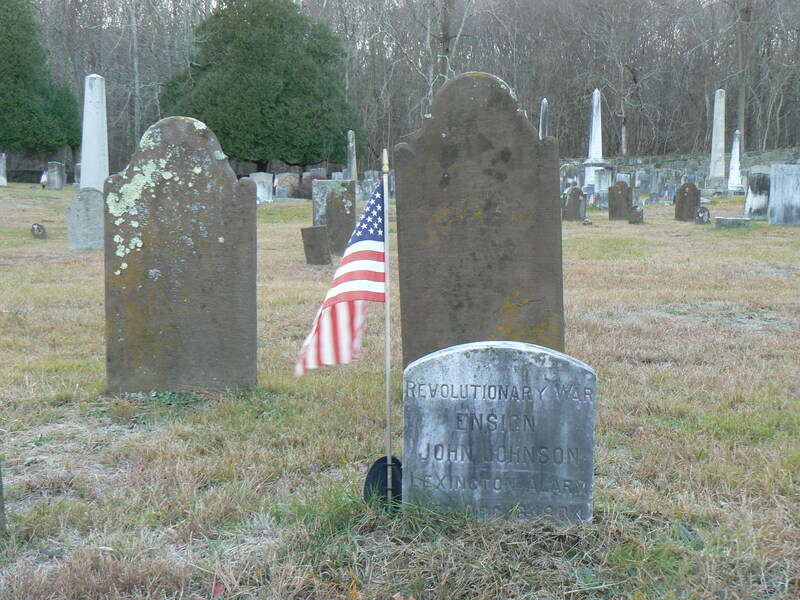 The cemetery, which was formed in 1719, also has a number of modern markers honoring the graves of residents who served in the French & Indian War, American Revolution, Civil War, and other conflicts. The plaque also lists the names of 91 residents who served in the Civil War, as well as its dedication date of June 14, 1926. 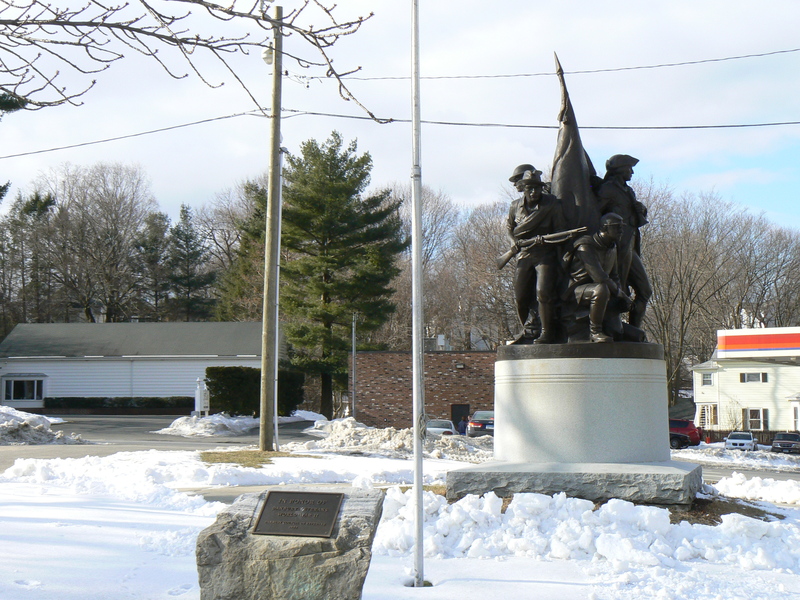 The relatively late dedication makes the East Lyme memorial one of the state’s last Civil War monuments with a dedication ceremony that could have been attended by veterans of the conflict. 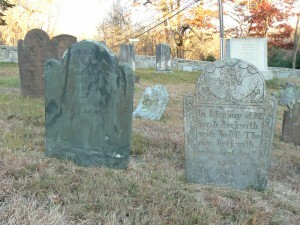 Old Stone Church Burial Ground is at the intersection of Society and Riverview Roads in the Niantic section of East Lyme. 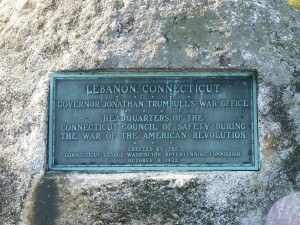 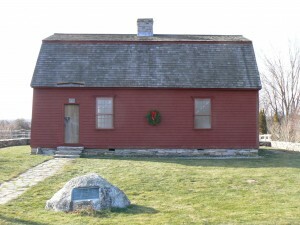 The former store in which colonial governor Jonathan Trumbull held more than 1,100 planning meetings during the American Revolution stands on Lebanon’s green. 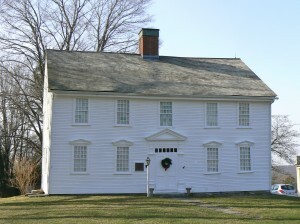 Known today as the War Office, the building was built around 1727 as the Trumbull family store. The store, which has been moved three times, originally stood along Exeter Road (Route 207). 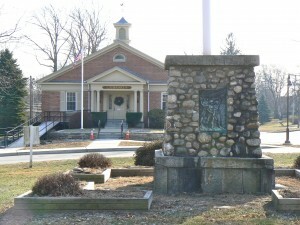 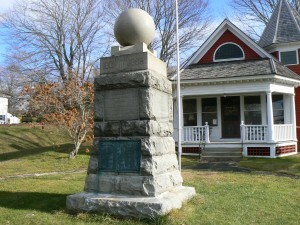 The War Office, donated to the Connecticut Society of the Sons of the American Revolution in 1891, has stood on in its West Town Road location since 1844. 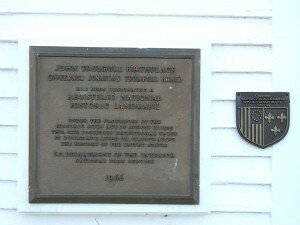 The building is identified by a plaque mounted on a boulder in 1932 as part of Washington bicentennial celebrations. 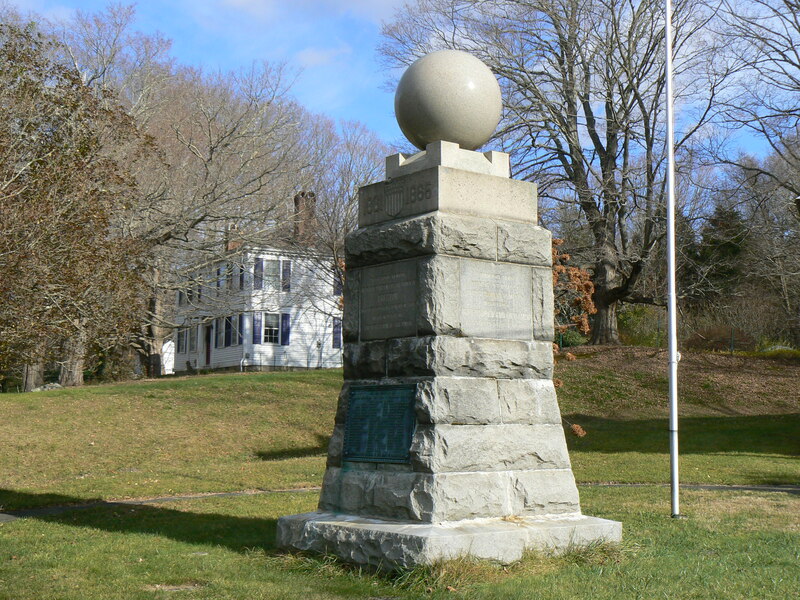 As the American Revolution broke out, the state’s General Assembly formed a Council of Safety to coordinate efforts to recruit and supply Continental troops. The council met in the Trumbull store building throughout the war, with attendees including George Washington, Israel Putnam, Marquis de Lafayette and other notables of the day. 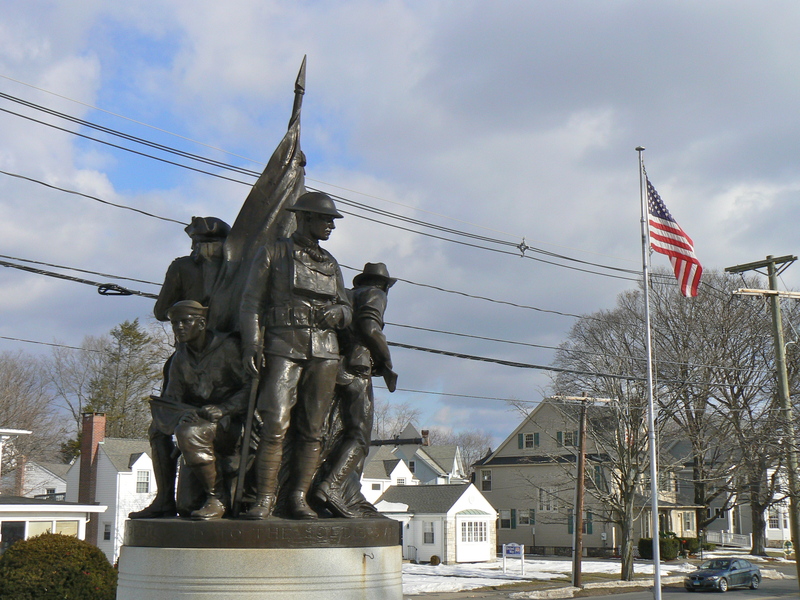 The War Office is open to the public on weekend afternoons between Memorial Day and Labor Day, as well for other events. 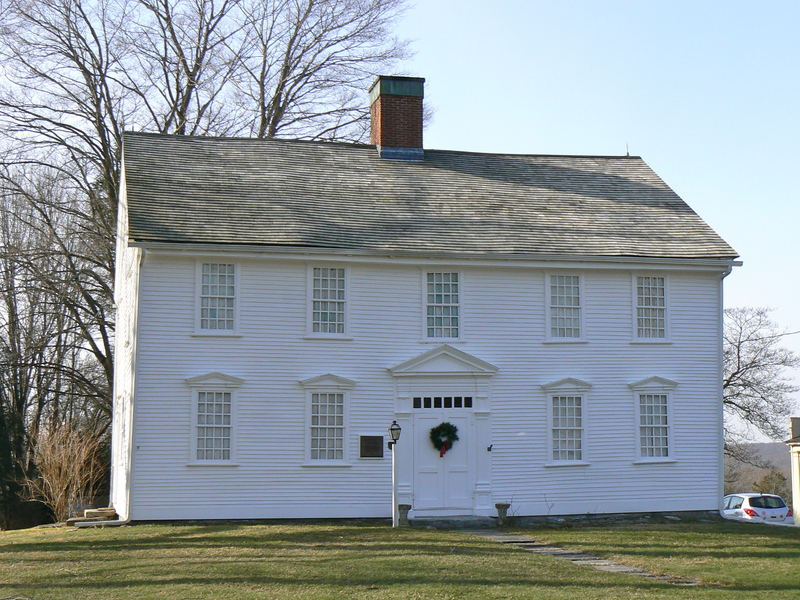 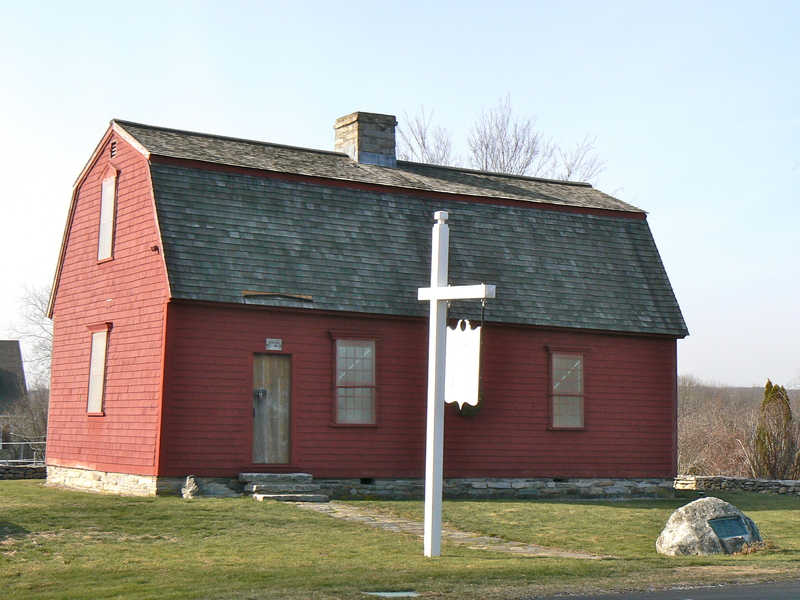 A short walk south of the War Office stands the Trumbull family home, which is operated as a museum by the Connecticut Daughters of the American Revolution. 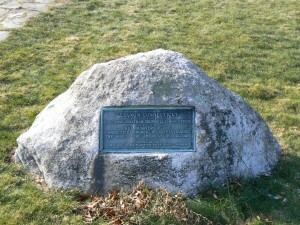 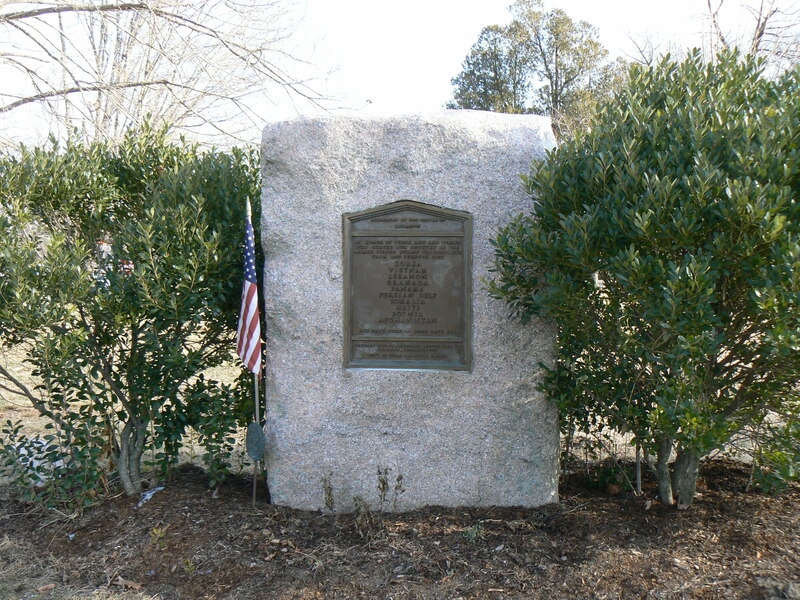 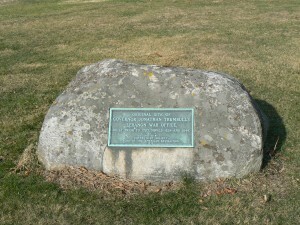 The War Office’s original location on Route 207, around the corner from the Trumbull home is marked by a 1932 plaque mounted on a boulder. Jonathan Trumbull is also honored with a statue in his namesake town of Trumbull. 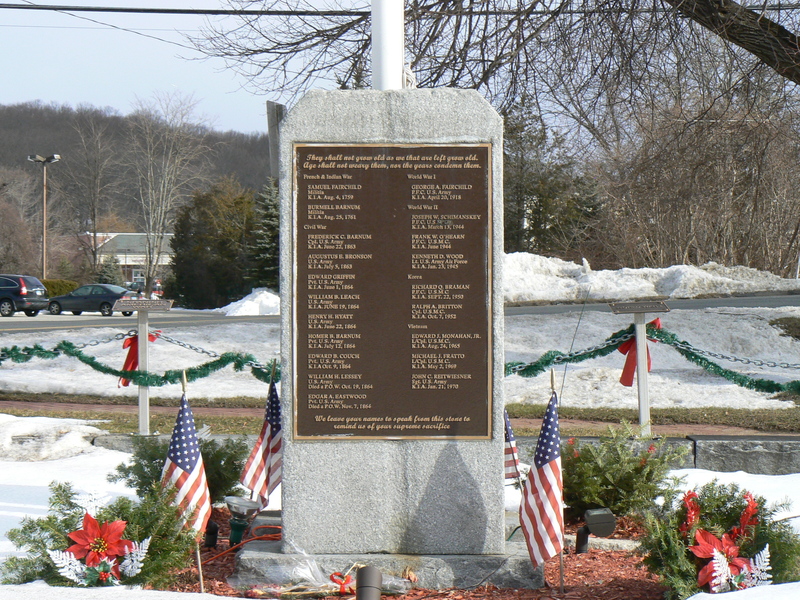 Lebanon honors its war veterans with several monuments on the green near the intersection of Exeter Road (Route 207) and Norwich-Hartford Turnpike (Route 87). Near the northern end of the green, in front of Town Hall, is a 1922 monument honoring veterans of five wars between the American Revolution and the First World War. The monument features a stone cairn, serving as a flagpole base, with bronze plaques on the cairn’s four sides honoring local veterans. 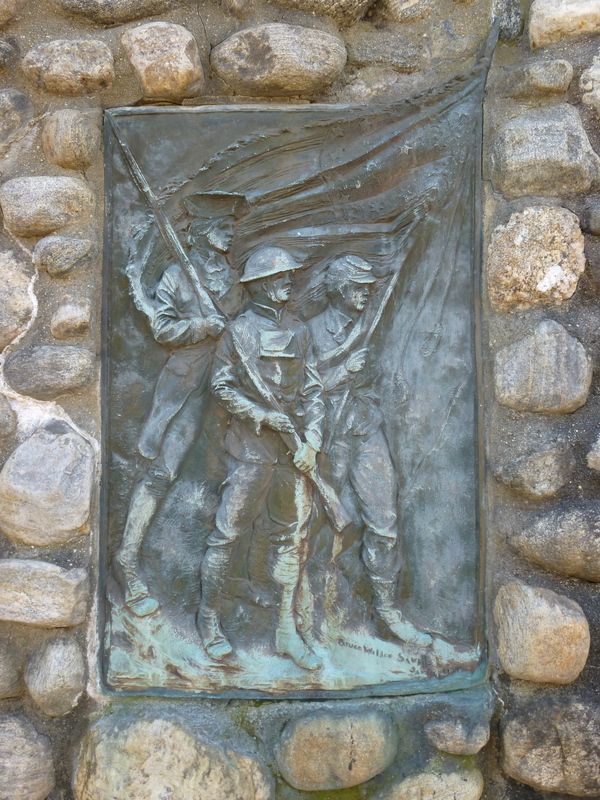 The north face of the monument features a plaque with a scene depicting soldiers from the American Revolution, Civil War and World War I marching together under an American flag. 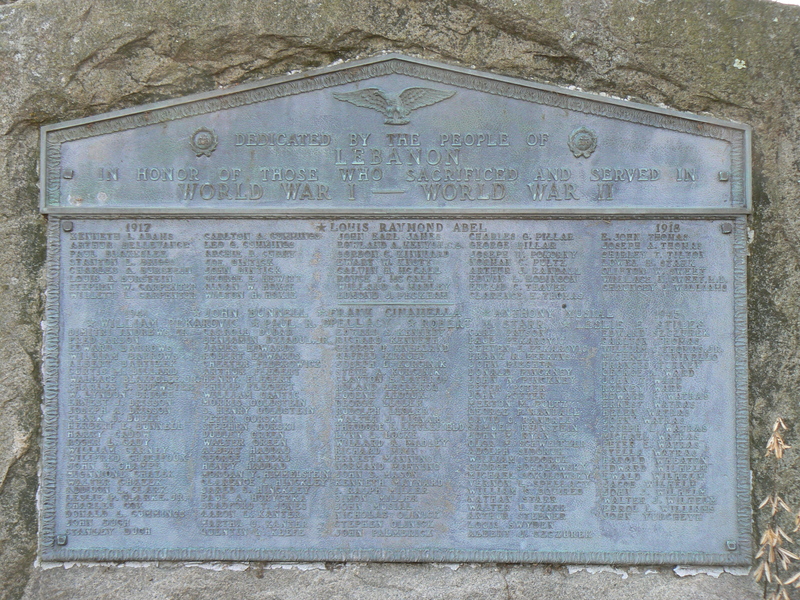 The west face of the monument bears a plaque honoring those who served during the “Period of the World War” (the reference to war “periods” is uncommon among the state’s war memorials). 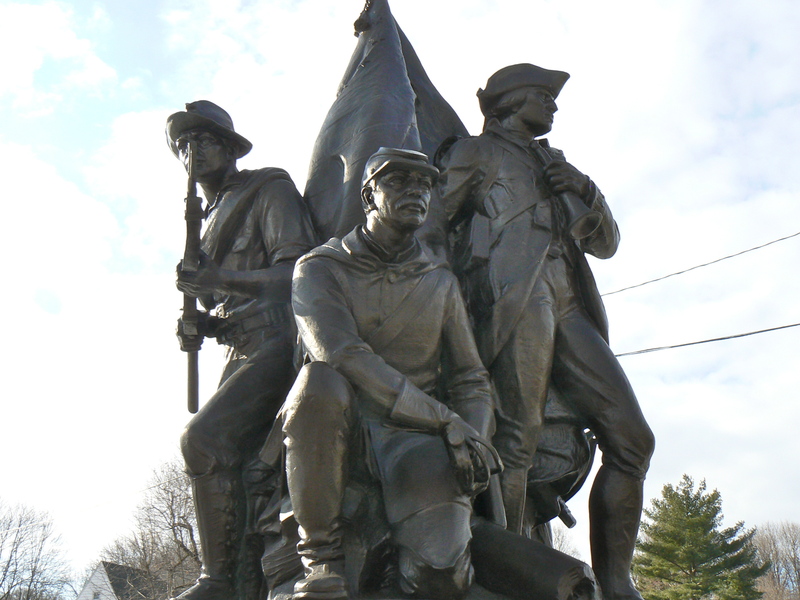 The east face honors Lebanon’s many contributions to the American Revolution as well as the War of 1812. 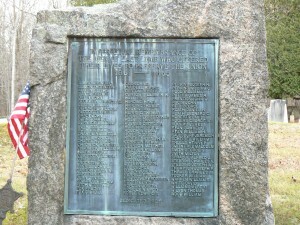 The dedication in the American Revolution section reads, “In memoriam to our fathers who fought for justice and liberty. 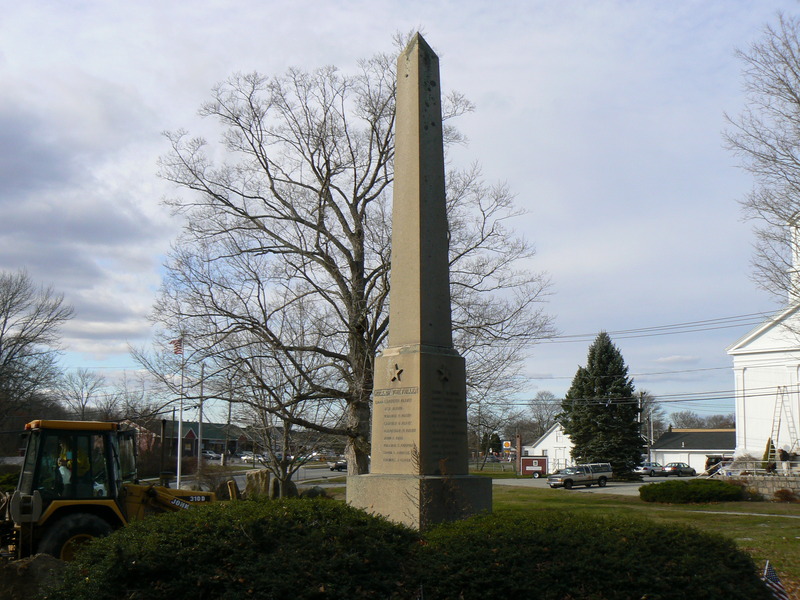 “When the war broke out, this town contributed the one loyal governor, brother Jonathan Trumbull, who among all the governors of the thirteen colonies, was the only one who stood staunch and true to the American cause. Washington relied on him in the most trying circumstances. 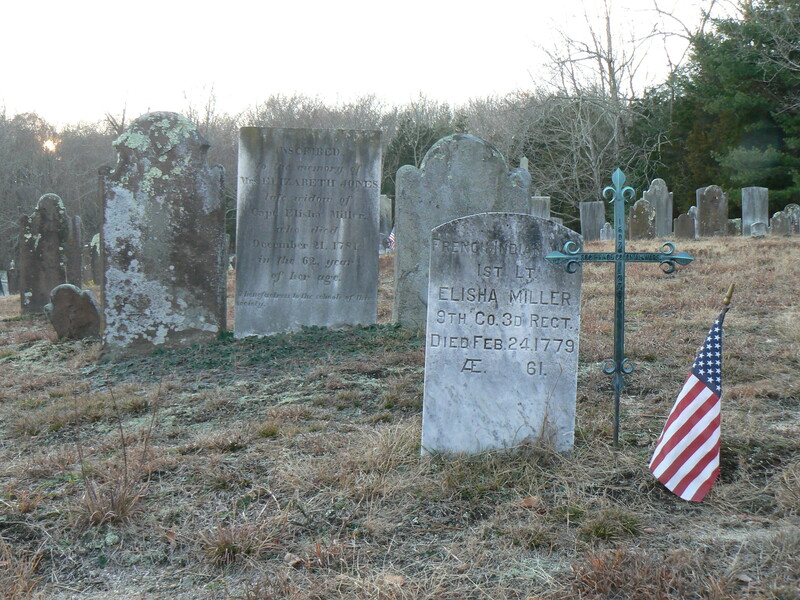 “William Williams, one of the signers of the Declaration of Independence, was born in Lebanon, the home of the Council of Safety. 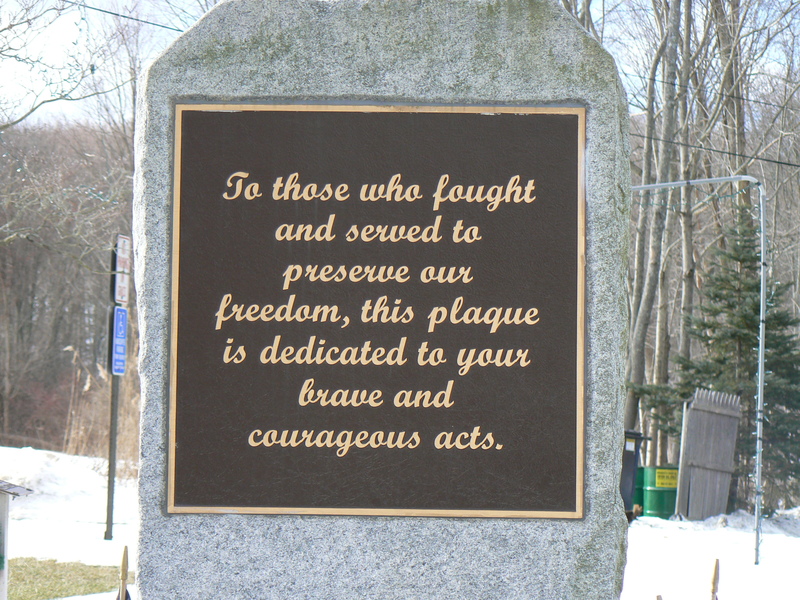 The plaques were designed by sculptor Bruce Wilder Saville, whose other works included war memorials in Massachusetts, New York and Ohio. 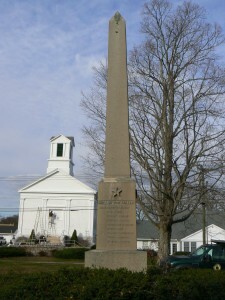 The monument was built by a local mason. 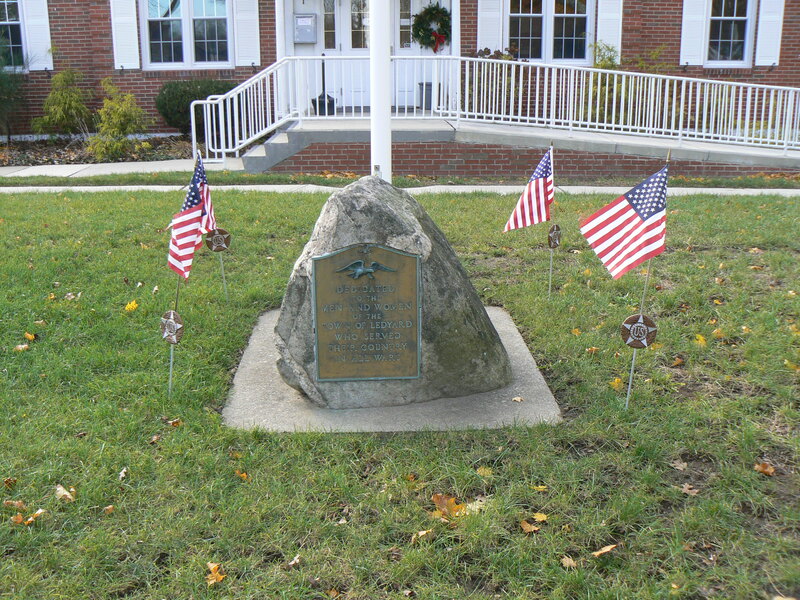 An undated memorial near the northeast corner of the green honors Lebanon’s veterans of the two World Wars. 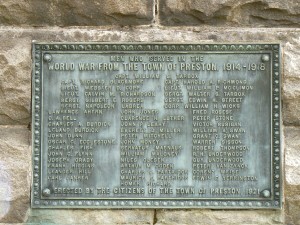 The World War I section lists 40 names and honors one resident who was killed. 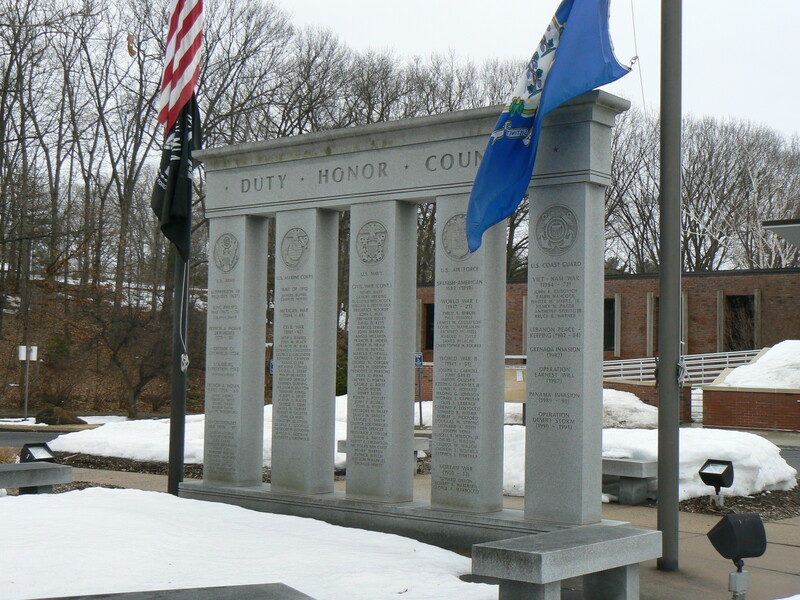 The World War II section lists about 135 names and honors seven who were killed. A 2002 memorial near the northwest corner of the green honors veterans of recent conflicts including Korea, Vietnam, Lebanon, Granada, Panama, Persian Gulf, Somalia, Haiti, Bosnia and Afghanistan. 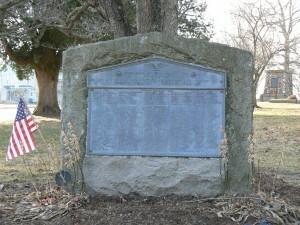 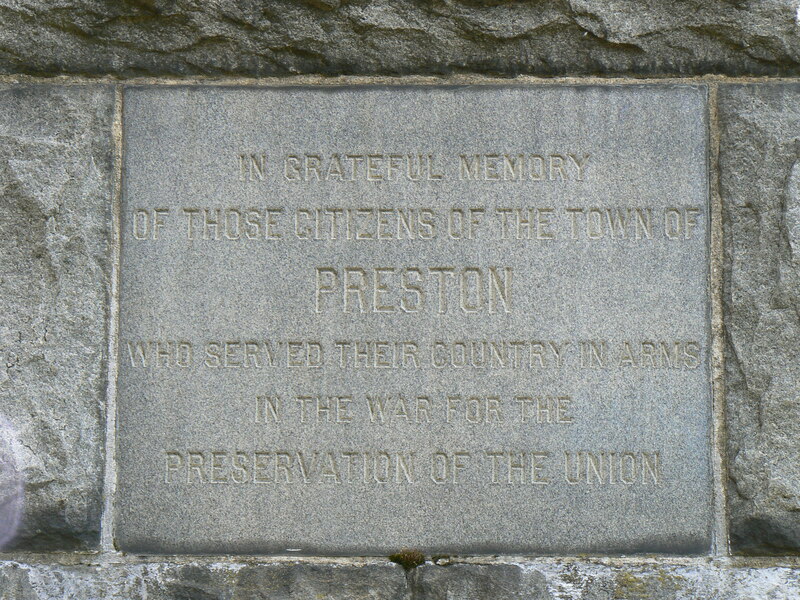 Preston honors service in the Civil War and World War I with a large monument on Jewett City Road (Route 164). The 1898 Soldiers’ Monument, which also marks the birthplace of American Revolution general Samuel Mott, stands in front of the former town library building just south of the intersection of Route 164 with Shetucket Turnpike (Route 165). 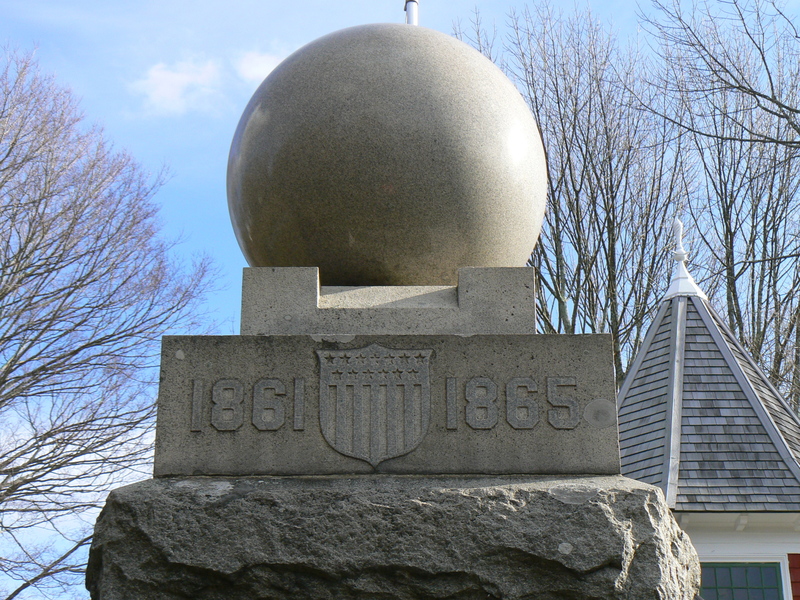 The northwest face also features a raised United States shield flanked by the years when the Civil War was fought. 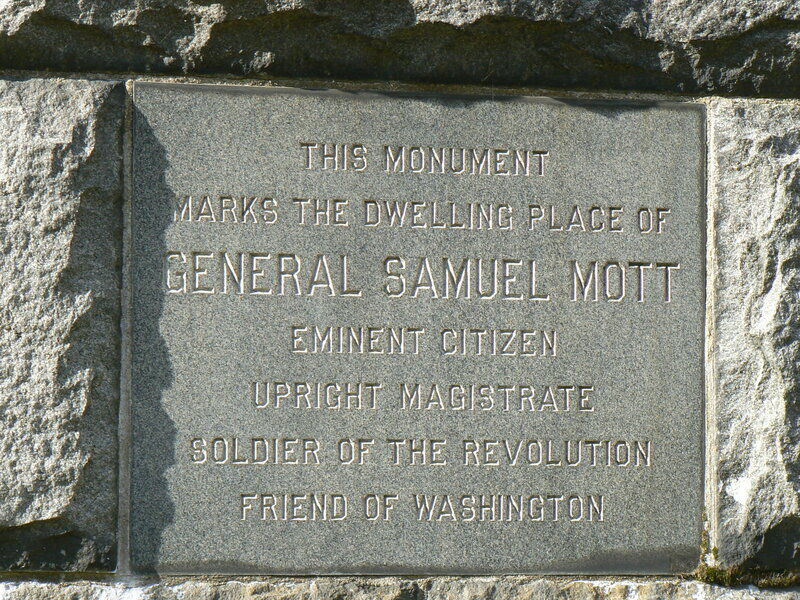 Mott was an engineer who served at Fort Ticonderoga in New York as well as forts in New London and Groton. 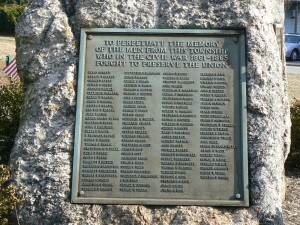 On the monument’s northwest face, a 1921 plaque lists about 50 residents who served in World War I. The land on which the monument and the former library, now the home of the Preston Historical Society, was donated by the Brown family along with the monument. The monument and the library were both dedicated on November 25, 1898. The site also features two mortar cannons as well as pyramids of cannonballs. 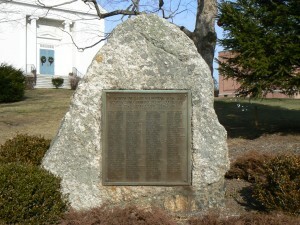 The monument, supplied by the Smith Granite Company of Westerly, Rhode Island, was restored in 2000. 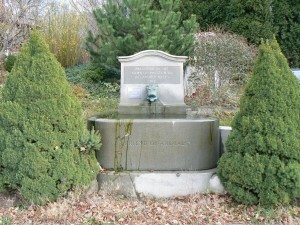 A spring-fed horse fountain donated in 1918 by retired inventor DeLambre Bates stands a short walk southwest of the Soldiers’ Monument site. 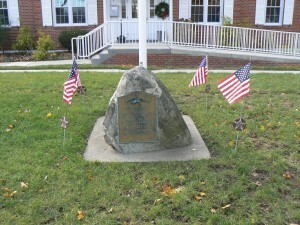 Preston honors American Revolution veterans with a simple monument on a small green. 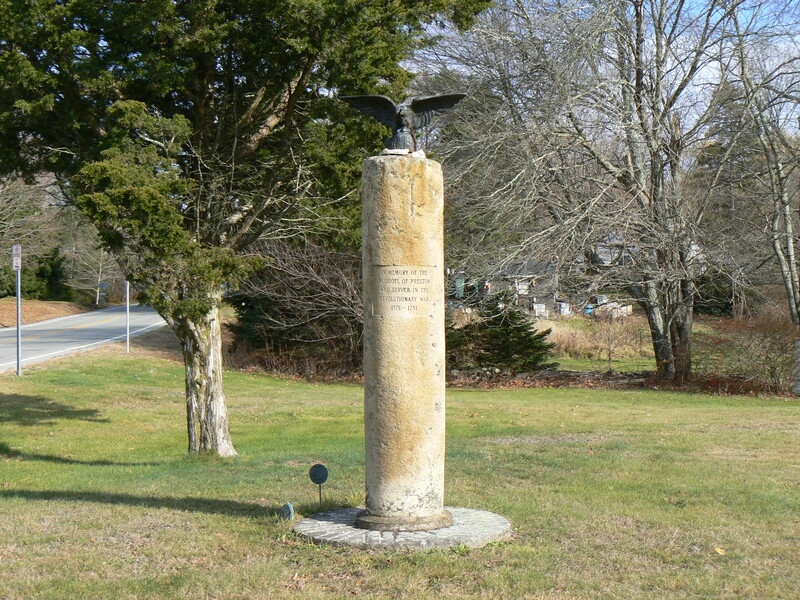 The monument, at the intersection of Shetucket Turnpike (Route 165) and Old Shetucket Turnpike, features an eagle atop a granite pillar. The pillar, a former farm implement that was pulled by oxen to flatten fields, stands atop a former millstone. An application to list the Preston City Historic District on the National Register of Historic Places provides a 1967 dedication date for the monument. 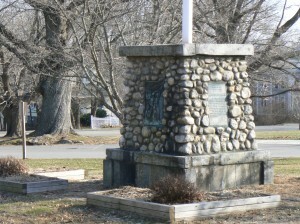 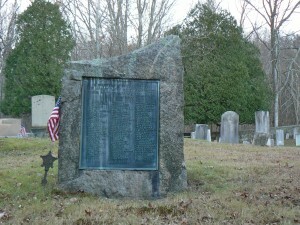 The Preston memorial is nearly identical to a veterans’ monument in the Gales Ferry section of Ledyard. 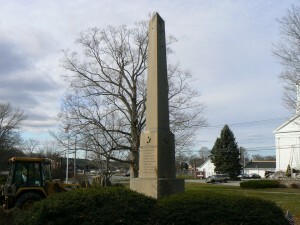 Ledyard honors its Civil War heroes with a granite obelisk outside one of the town’s libraries. The north face also features a raised United States shield and two crossed swords. 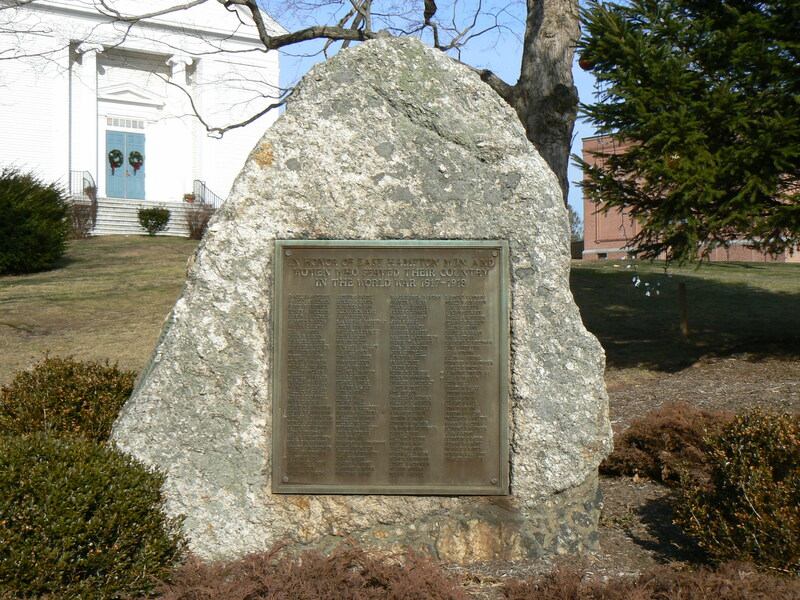 The south, east and west faces bear the names of 29 Ledyard residents killed in the Civil War. 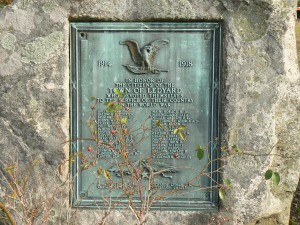 The monument was donated by Ledyard Bill, a Ledyard native who prospered in the publishing industry in Kentucky and New York. 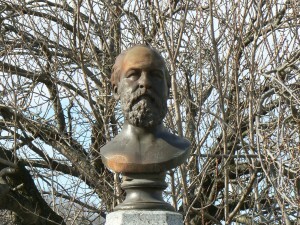 Bill later served as a legislator in Massachusetts. 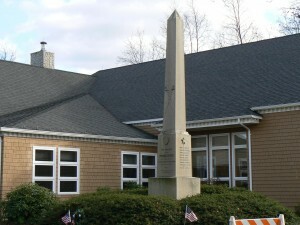 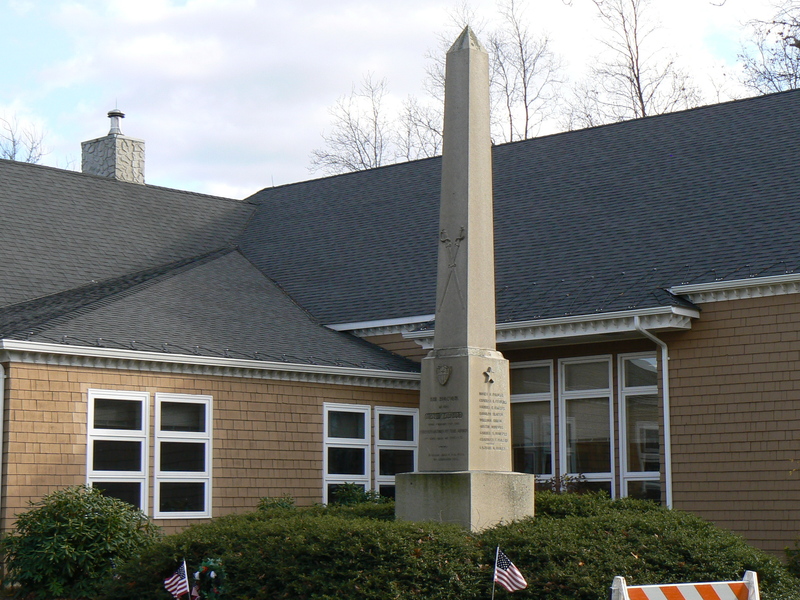 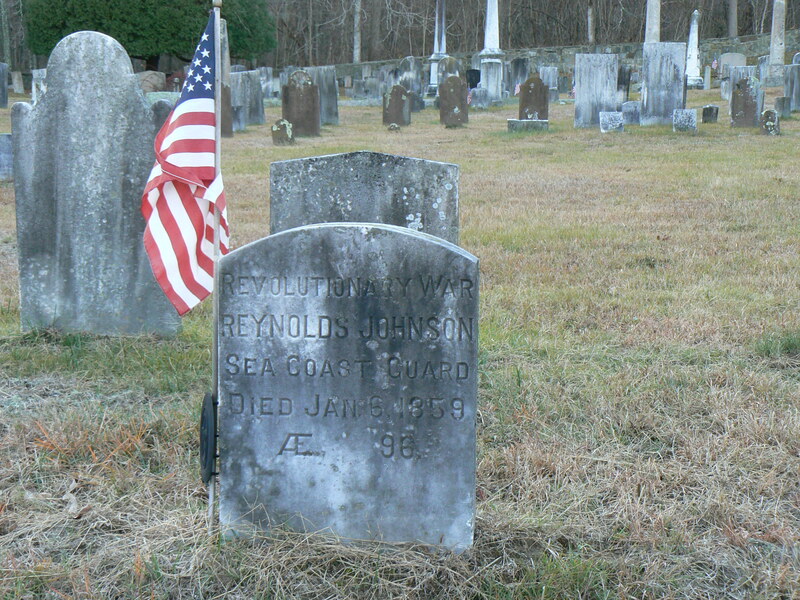 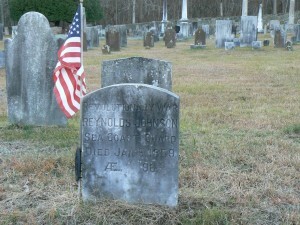 Bill’s family was long active in Ledyard, with a brother endowing the Bill Library next to the Civil War monument, and another brother funding the Bill Memorial Library in Groton. 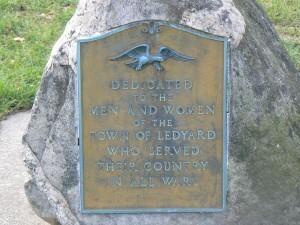 A short walk away from the Civil War monument, a collection of monuments honors Ledyard’s veterans of other wars. 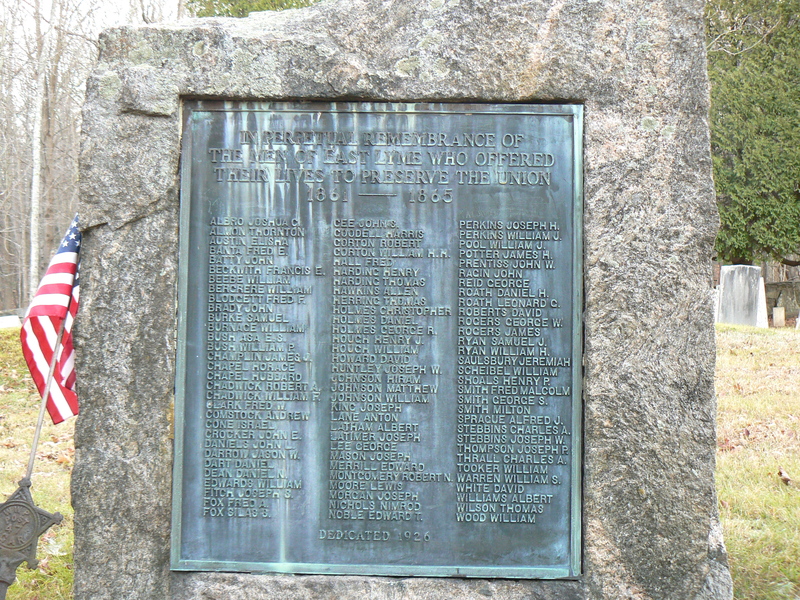 A bronze plaque affixed to a boulder honors 32 residents who served in World War I and four who were killed. Inscriptions on other boulders honor veterans of the American Revolution, World War II, Korea and Vietnam. 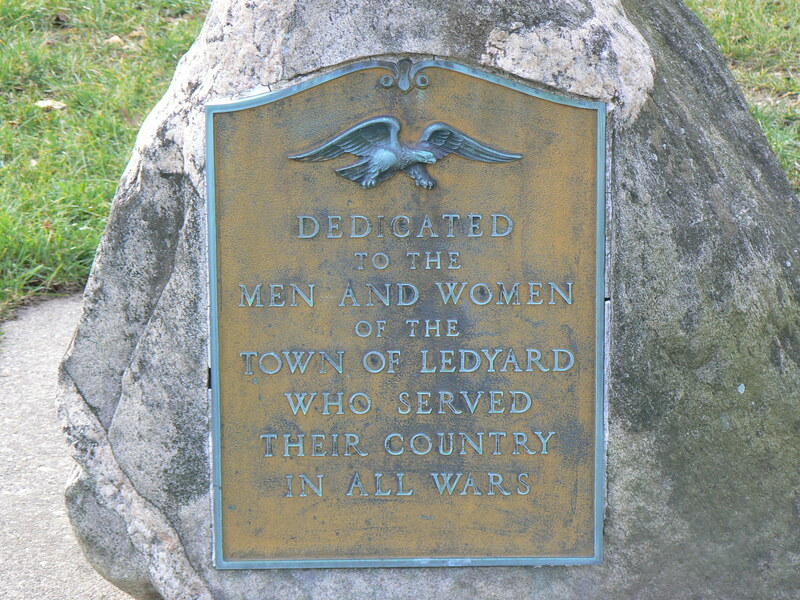 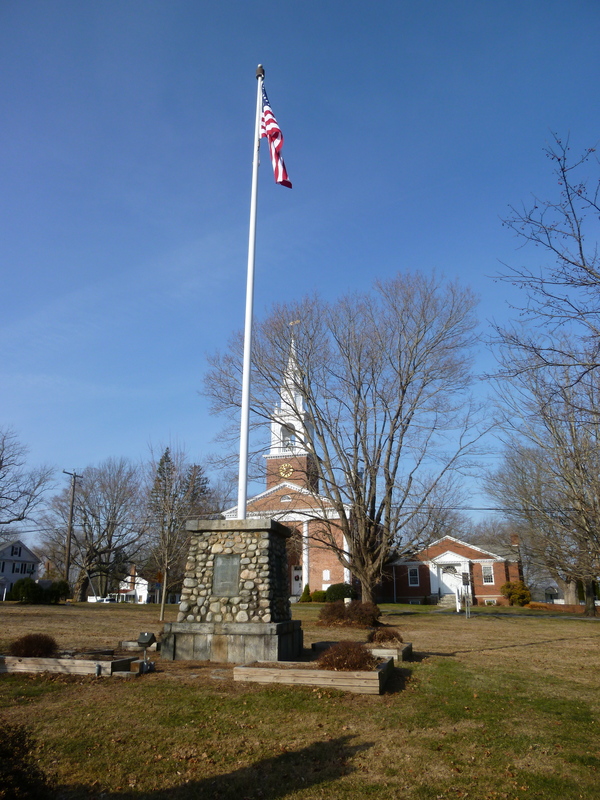 About a quarter-mile north of these monuments, an undated memorial in front of Town Hall honors all of Ledyard’s war veterans.